If you don't want to pay $350 or more for Samsung's Gear S3 smartwatch, here is a deal that might save you a lot of money. 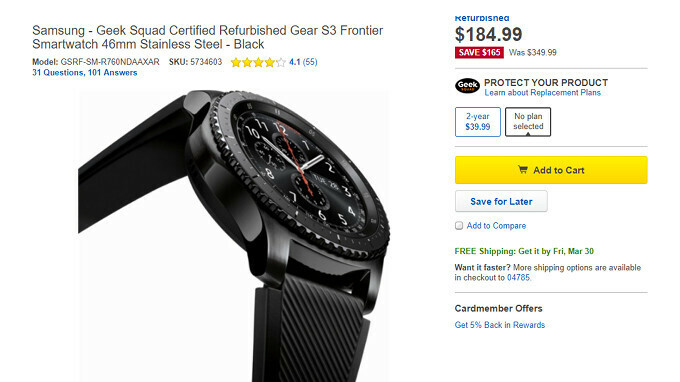 For a limited time, Best Buy offers the Gear S3 frontier for just $185, down from $350. However, the Samsung Gear S3 frontier 46mm stainless steel comes in refurbished form. Specifically, the refurbished smartwatch is certified by Geek Squad, Best Buy's subsidiary that offers decent service and support. Keep in mind that you'll only find the refurb Samsung Gear S3 in black color. Also, you'll be getting a 90-day warranty if you purchase it, so you're covered in case the unit you buy proves to be flawed. The Gear S3 frontier is an excellent smartwatch that features IP68 water-resistance, as well as multiple connectivity options such as Wi-Fi, Near Field Communication (NFC), and Bluetooth. Don't forget to read our full Samsung Gear S3 frontier review for more details about the smartwatch. I just got a brand new Gear S3 Frontier, moving from the Great Sport which I handed over to my wife. Main reasons are Frontier is bigger in battery, screen and the speaker is important for those alarms. A very good deal with the low price. Still about 90 bucks more than I'd pay for any so called smart watch. Buddy gave me his old zen 2 smartwatch for a weekend. Set it up, played with it for an entire weekend. Gave it back the following Monday. For what I do with a phone, connected to a BT headset...I don't see the "need" for a smartwatch. I have a clock on my wrist that has the time, day/date, 3 time zones, battery lasts for YEARS, for less than 50 bucks. Everything else, is contained in my phone, belt clipped to my belt.